The International Surfing Association is pleased to announce the ISA China Cup, which is the first event of the ISA’s Hainan Wanning Riyue Bay International Surfing Festival, has confirmed two of eight teams that will be competing in China from January 26 to 27. 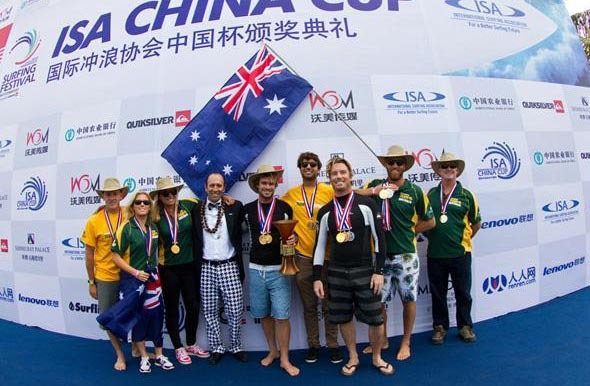 The defending Team Champion, Australia will be looking for their second consecutive Team Gold Medal, while Peru’s talented team will strive to improve on their fourth place finish in the ISA’s inaugural event in China one year ago. Following the ISA China Cup will be the ISA’s Hainan Classic, 4-Star Men’s ASP, with a prize purse of $ 95,000 USD and will take place from January 28 to 30, featuring the best surfers in the world competing for a berth on the ASP World Tour. Representing the Aussies in the ISA China Cup will be an experienced young group of surfers featuring Wade Carmichael, Mitch Crews, Lincoln Taylor and Connor O’Leary. On the women’s side will be Nikki Van Dijk and Philippa Anderson.